SDF stands for Straight, Draw, Fade. It is a simple concept that has proven to be very effective. 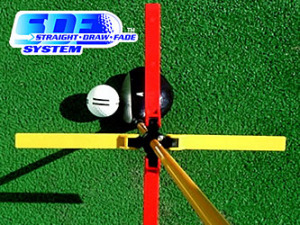 Just line up the red blades to the target line in all positions and follow the easy to understand steps and you will hit the ball straight...it's that simple! If you have any questions regarding the SDF Golf System -The Helicopter, please give us a call, we would be happy to help you with any questions you may have. Write an online review on the SDF Golf System -The Helicopter, and share your thoughts with others.